The cartographer Mercator is historically the world's most famous maker of maps. Everyone interested in maps and the science of cartography should visit the Mercator Museum in Belgium in the charming city of Sint-Niklaas with the largest market square in Europe, just south of Antwerp. We are not affiliated with the museum in any way, but we include below materials from the museum which we obtained upon our visit to it. 2-5 p.m. on Thursday-Saturday, 10 a.m. to 5 p.m. on Sunday. The commemoration of the 400th anniversary of Gerard Mercator's death on 2 December 1594, was the impetus for the renovation of the museum, which was reopened on 26 March 1994. The Mercator Museum allows the visitor to become acquainted both with the rich Mercator collection of the Royal Archaeological Society of the Land of Waas, the most important one in Belgium, as well as with modern day cartographic techniques. 3/ modern cartography in Belgium (from 1831 through to present day). As a means of introduction, it is made clear to the visitor what a map actually is and what knowledge is needed in order to make a map. Here, terms such as projection, scale, geodetic net are explained. The history of cartography before Mercator is sketched with the use of examples of maps from Antiquity, the Middle Ages and the age of discoveries. Gerard Mercator was born as Gerard de Cremer in Rupelmonde on 5 March 1512. 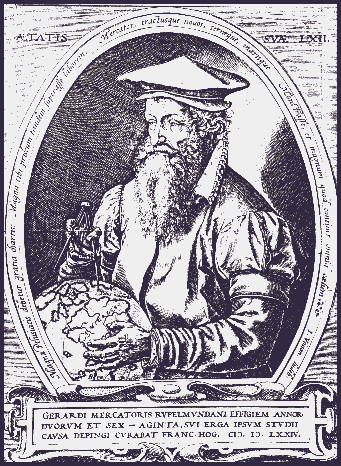 He always signed his work as Gerardus Mercator Rupelmundanus. In 1530, he registered himself at the university in Louvain, where he studied the humanities, and received the degree of 'magister artium' in 1532. After a short stay in Antwerp, he returned to Louvain in 1535 and began studying mathematics, under the tutelage of Gemma Frisius, and made scientific instruments, in order to earn a living. In 1537, he published his first map, which was immediately successful: a map of Palestine, meant to illustrate texts from the Bible. The following year, he published a small map of the world in double heart-shaped projection. Mercator acquired a name with his Map of Flanders in 1540, that was dedicated to the emperor Charles and which was quite accurate owing to the triangulation method. The most highly prized pieces of the historical section are without a doubt the original terrestrial and celestial globes, made by Mercator in 1541 and 1551 respectively, and which were restored for the occasion of the Mercator year. In the meantime, Mercator went through hard times: in 1544, he was imprisoned for seven months in the Rupelmonde citadel on accusation of heretic sympathies. He left Louvain in 1552 and settled in Duisburg on the Rhine, where he produced his most important cartographic works. One of the first masterpieces that saw the light of day here in 1554 was a map of Europe, a milestone in the history of cartography. On a astronomical-mathematical basis, he improved on the work of Ptolemy, whose vision had determined the world picture up to the 16th century. In 1569, the world map 'Ad usum navigatium' or 'for the use of the sailors' made its appearance, which was Mercator's last map in large format and the first (and only) map on which he used the cylindrical projection bearing his name. With this, it was possible for sailors to chart their course on the map as a straight line. In the years that followed, Mercator tried to achieve his life's dream: the publication of a Cosmography, a synthesis of the history of heaven and earth. The name of Mercator will always remain linked to the publication of the Atlas, a cartographic overview of the modern world. The first part appeared in 1585, the third and final one not until 1595, after Mercator's death. Together with the monumental wall maps, these and other publications give a picture of Mercator's versatility. The collection is completed by a series of Mercator-Hondius atlases, published by Jodocus Hondius after Mercator's death on the basis of the latter's work. After the division of the Netherlands in 1585, the centre of cartography moved to Amsterdam. The visitor continues on his way past splendid original maps from the 17th century and following that, gets acquainted with famous cartographers from the Austrian and French period (de Ferraris, Delisle). In the 19th century, our own national cartography was created, of which the evolution up to present day is the subject of the 'Modern cartography' section, established in co-operation with the National Geographic Institute in Brussels. Whereas the first and second panels could be filled in by delving into the rich collections of the Royal Archaeological Society of the Land of Waas, completed with a limited number of lent items, for the development of a 'Modern Cartography' section, the city council had to fully rely on co-operation from third parties from outside of the region. 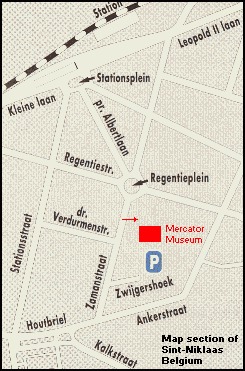 Through the Mercator year, close contacts developed between the city council and the National Geographic Institute, which as a federal public service institution delivers a whole range of cartographic and geodetic products and services, and as such, appeared to be the ideal partner for further expanding the already existing Mercator Museum. On 30 November 1995, an agreement of co-operation was signed by the city council and the National Geographic Institute, in which the N.G.I, lends on a long-term basis about 70 (mainly maps, plans, apparatus) and the city council commits itself to supplying the infrastructure necessary to exhibit this material. This section makes it clear which steps the N.G.I. has taken since its foundation in 1831 under the name 'Dépot de la Guerre', to become the establishment that today delivers a whole range of cartographic and geodetic products, assisted by state-of-the-art techniques. Original maps, plans, equipment and instructive panels illustrate the evolution from the very first military 'ordnance survey maps', surveyed in the field, via aerial photography up to the cartographic databanks of today. Terms such as GIS (Geographic Information System), GPS (Global Positioning System) and teledetection all belong here, just as the contribution by various Flemish companies active in this high-tech sector. The exhibition makes it clear that besides being a science in full evolution, cartography is also an everyday aid for anyone going on a trip, far away or close to home, with uses in many fields and with a variety of activities in our society. In the exhibition, we literally broaden our field of vision and look into space from where satellites transmit information about ourselves and our planet. The world on a map: an unsolvable problem? Since it was discovered that the earth is round, cartographers have been wrestling with the unsolvable problem that it is impossible to correctly put the world on a map. In order to make the museum visitor aware of this problem, he can first get acquainted with diverse cartographic illustrations or map projections. The official cartography in Belgium started in 1831 with the establishment of a 'Dépot de la Guerre', which was commissioned to research and gather existing map material and to prepare maps for war-time operations, a clearly military task. For years, and even up to this day, the official topographical map has been known as the 'ordnance survey map'. However, the activities of this establishment increased, equally in the scientific realm as well as that of measuring, drawing and printing. The Depot was thus renamed to the Military Cartographic Institute (1878). In this period, the first large scale basic map was worked on, supported by scientific data, for which all sorts of measurements were taken in the field and frames of reference were established. After W.W. II, the Institute was not only transformed to the Military Geographic Institute, but they also switched over to a totally different technique, namely aerial photo-topography. Since 1976 and up to present day, the establishment works under the name 'National Geographic Institute'. As a federal public service establishment, the National Geographic Institute publishes, besides the official topographic basic map, a whole range of cartographic and geodetic products and services, making use of the most advanced techniques. Since 1947, topographic maps have been produced with the use of aerial photos. Maps, photos and apparatus from the N.G.I, archives make each step of the whole aerial photo and topographic map process clear for the visitor. Getting the basic map ready to print to a scale of 1:25,000 is a tremendous amount of work. In order to overlap the whole country, 237 sheets were worked out in the period from 1947 to 1970. Maps to other scales are derived from the basic map. Through means of generalisation, maps to a scale of 1:50,000 and 1:100,000 were produced. In 1988, the computer made its entry into the world of cartography. The editing and processing of aerial photos has been thoroughly changed. The recorded pictures are digitalised and the geographic information can be processed into a map or a digital databank. In addition to the National Geographic Institute, a number of Flemish companies, active in the cartographic sector, also display their products in this panel of the exhibition. The cartography of the '90's cannot get along without terms such as GIS (Geographic Information System), GPS (Global Positioning System), Navstar (Navigation satellite system). A map offers insufficient possibilities for clearly presenting all information about three-dimensional objects (ground, undergrowth, habitats and inhabitants, etc.). The legibility and the precision suffer. A computer-controlled system was developed to file, manage and analyse the three-dimensional information. The star navigation system -GPS Navstar- enables every user to determine via satellite his position, speed and time, at any moment, anywhere on earth and regardless of the atmospheric conditions. The space segment consists of 24 satellites in 6 orbits at an average height of approximately 20,000 km. The N.G.I, calls on the satellite system in order to determine with extreme accuracy the co-ordinates of places. Nowadays, the hiker in the mountains, the yachtsman or the rally driver can also purchase a receiving unit with which he can very easily determine his position. The GPS receivers are also built into vehicles, in combination or not with a board computer. Every phenomena on earth has the characteristic of transmitting or reflecting electromagnetic radiation, according to its own individual pattern and with a specific strength. Through this, individual phenomena can be distinguished from one another. Teledetection contains all the techniques with which, based on this characteristic, data about far away phenomena can be recorded. Through teledetection, one can trace such phenomena as air pollution, deforestation and the formation of desserts. The growth of cities and urban areas, changes in the use of ground and natural resources can also be better detected. This page was last updated May 30, 2012.